A question in my feed at Quora triggered me to write an answer about some of the challenges that we confront when we attempt to attend to needs–both our own and those of others. Organizations have their very own issues with the shift from exploitation to need fulfillment as a business value proposition. But business cultures are also what emerges from the sum total of the people who staff the organization, and from the quality of their interactions. What we bring to the organization personally contributes to the overall culture of the organization, so that change must also begin with each individual. Attending to needs is something which the whole of modern society has been struggling with for hundreds of years, as we make the transition from authoritarian patriarchies to genuine democracies which is still ongoing today. What we have learned at home and in society we bring with us into our organizations, and we will need to reevaluate many of the strategies we have learned at home in terms of their usefulness and productivity for our role in organizations focussed on fulfilling needs as a value proposition. It may seem from a business perspective like a step too far to think about needs on such a personal level when considering what makes for business success. Inevitably, however, when we understand that it is our ability to connect with our employees and customers on a needs level that marks success in today’s markets, we have to think about how we can develop the capacity for connection individually as people as well. Here is the post from Quora: Adult emotional health depends at its root on our internal capacity to attend to our core needs. “Connection,” “attunement,” “trust,” “autonomy” and “love-sexuality” belong to the core needs whose fulfillment is essential to well-being. As the primary care-givers who attend to an infant’s needs, parents play a huge role in the development of emotional and neurological capacity for “self-regulation.” If our care-givers connected with us well, were attuned, and trustworthy, then we likely developed a neurological and emotional capacity for the same. The survival strategies the brain develops to adapt to developmental trauma come with a high price: we survive, but at a much diminished capacity for happiness, fulfillment, relationships, health and productivity. The good news is that it is never too late to attend to our core needs. Good friends and family can provide deep support. However, the survival strategies are their own barrier when it comes to meeting the needs they were developed to compensate, and family and friends are rarely trained to understand the relational dynamics which can be the result. To compensate for unmet needs, we develop shame and pride-based identifications which fortify the survival strategy and make it resilient to change. For example, in the connection survival style we tend to feel shame for existing, and feel like we don’t belong. To deal with the shame, we will often feel pride at being a loner, in not needing others, and at not being emotional. A friend who responds to a perceived need for connection may be rebuffed, as his response challenges our identification as a loner, and so the identifications stand in the way of the fulfillment of exactly the core need they compensate for. To heal the trauma of early failure to attend to core needs as an adult takes a little help in understanding our needs and strategies, and a lot of time to gain new experiences to address our core needs. We know we are doing this successfully when we experience an increase in our capacity for connection and aliveness in our relations with ourselves and others, and the better physiological and neurological health that comes with good self-regulation. One of the biggest challenges of modern organizations trying to make the transition from command and control hierarchies to agile bottom-up innovation organizations is to learn how to connect with people. Where many organizations think they are connecting with people, they in fact produce the opposite effect of alienating and pushing people away. The operational mode of classical organizations is work in terms of rules and processes, where employees are resources and the purpose of customers is to be exploited to fulfill a profit motive. Connecting with people, on the other hand, means attending to their needs, to create an experience of employee and customer intimacy which provides the genuine value that ultimately is the reason employees are engaged, and that customers are interested, loyal und want to finance our livelihood. Bob Marshall @flowchainsensei has developed a framework he calls the Antimatter Principle, applying Marshall Rosenberg’s Non-Violent Communication to software development by showing how the objective categories of business management can be understood in terms of needs. Identifying business areas of action as needs fulfillment issues is a first huge step in shifting business away from its classical exploitative mode of operations to a sustainable value creation mode. Once the intellectual framework has been articulated, however, people still need to learn how to connect with people on a professional level that organizations are by their very nature as functional hierarchies of power very bad at, because it involves letting go of most of the things that businesses have identified with in the past. Hierarchies give way to networks, top-down initiatives give way to bottom-up innovation, profit gives way to value creation (an oblique approach to making money which works much better! ), reporting up the hierarchy for control purposes gives way to transparency based on metrics that teams use to regulate their activities themselves. Most importantly, employees and customers become partners in the search for ways to fulfill needs, which becomes the ultimate purpose of the organization. Businesses can start making the transition to genuine value creation through human connection by practicing a combination of agile organizational culture, supported by methodologies like Kanban or Scrum, through servant leaders who enable the self-organizing dynamics of their people, and by helping people to develop the personal skills of connecting to others on a needs level. Making need fulfillment the subject of business activity is what provides the context for genuine innovation and growth, as nothing drives human activity as productively as the striving to have our needs met, or the joy we experience meeting others’ needs and having our needs met in return. In a discussion thread at Naked Capitalism I found this Zen teaching story about dealing with a troubling hallucination (below). It shows how perceptive and practical Zen discipline strives to be. The master sees the ghost for what it is (a figment of the learner’s imagination), and he thinks of an experimental way the learner can discover for himself where the ghost comes from. Telling the man the truth would contradict his experience and lead to denial. Enabling his own discovery of the truth resolves the problem. The challenge of teaching lies in having just such ideas again and again, in ever-changing circumstances, for people seeking answers to problems that cannot be resolved because they are sustained by the perception of the seeker himself. Objective answers reinforce the belief behind problem. Insisting on the truth of what one says leads to unresolvable debates–secondary rationalizations employed to win arguments that only obfuscate reality. Even more challenging is that most of us don’t know what we are looking for when we ask for answers to our problems, as the learners in Zen stories never fail to express in their surprise at what they discover. Mastery develops when the teacher can be relied upon to enable an effective learning experience for the learner. Even greater ability is demonstrated when he has given up wanting to teach altogether, and begins to respond without purpose as the situation demands. The larger historical issues addressed in the Naked Capitalism post are beyond individual actors to influence. Change comes through collective experience, to which we can be but witnesses. But to witness is not passive. Collectively, awareness can move mountains. In our daily work, we often forget that management is a tool, not an end in itself, and so we miss the reality of what it is we are managing. In the case of “talent,” we want to support the growth of people, and to this end management can be at odds with the needs of talent. The goal of talent management is to find good people to hire, motivate them to join us and give the best of themselves, and support them in seeing their strengths and weaknesses and developing themselves in the time they spend with us. From the organizational side, it wants to understand the needs of the managers looking for talent, bring the right people together for the right functions, and enable the succession process which ensures that the best people will succeed the current managers in steering the fate of the company. Management systems can do none of this by themselves, only people can. There is no replacement for personal contact and interaction, where experience and insight enable us to exercise good judgment about who we can and want to work with. Many companies have understood that they are in the “people business.” But very few seem to have grasped what it means to live with people as people, not functions, on a professional basis. As always, grasping the soul of something is complex. At a first level, talent management is about relationship abilities. At a talk over coffee this week, a friend who does global talent management and I reflected on some of the leaders she supports. What I enjoyed from the start was the absence of manager-speak. The way she talks about people is based in complex perceptions about, e.g. their ability to connect with their staffs (or not), how they are able to see interrelationships and relate details to big pictures (or not), and of combinations of great skills with breathtaking blindspots and how those go together in personalities with a history she knows and reflects upon as the context of her understanding. Her complex understanding lets her describe developmental paths that the personalities behind the functions could take to realize their potential, and the ways she could provide the environment and the resources they would need. If I were in their place, I would feel seen und supported in ways the management systems by their very nature cannot do. When we focus on people like this, solutions are often quite simple. Difficult is managing the emergence of insight into the nature of the problem. How many talent management teams devote their time to emergent insight into the potential of their people? At a second level, understanding the essence of a task takes a philosophical bent of mind. Thinking, as one of my philosophy teachers used to say, has little to do with logic and much more with the presuppositions which inform our reasoning. For example, if we believe that business is about making money, and people are but resources to be used to that end, then we can spare ourselves the effort of talent management from the start and reduce HR to the transactional processes of contracts and compensation. In a shareholder value environment, talent management is a waste of time. It is much more efficient to focus on performance through outcomes than to invest heart and soul into developing people. But if the company embodies a philosophy of customer intimacy, great and innovative product development, or service to customers and society, not to mention the internal success factors of creating value through knowledge or design, talent management will be the company’s most important success factor (incidentally creating more shareholder value obliquely than the direct approach). The contrast between these two philosophical world-views could not be more fundamental. In a rip-roaring blogpost on the consequences of the transactional model of management for employee engagement, James Altucher (@jaltucher) explains to the downtrodden and disengaged masses of workers 10 Reasons Why You Have to Quit Your Job This Year (e.g. reason 3: Corporations don’t like you). I suspect that one of the reasons many corporations with a shareholder value philosophy still survive in the face of the way they manage their talent down to its lowest possible denominator (viz. Dilbert), is that their people haven’t yet grasped the more dignified alternatives. Had they enjoyed a talent manager like my friend, they would have had no choice but to leave, which is another serious argument for not investing in talent management worthy of the name for classical corporations. It just creates a mismatch between people’s expectations and company vision which harms the bottom line. A third level is strategic and concerns how we understand work. In “Race Against the Machine,” economists Erik Brynjolfsson and Andrew McAfee argue that one of the root causes of unemployment is not a slowdown in the pace of innovation, but quite the opposite. Technological innovation is accelerating, so that tasks can increasingly be automated which only a short time ago were considered to belong to an inviolably human domain. Google is bringing the driverless car close to the breakthrough point for production and public use; Philips is insourcing shaver assembly to Holland, not to flee rising costs in China and produce jobs at home, but because robots have reached the point where they can do fine mechanical assembly without many people; and the Singularity Hub reports on Philip M. Parker, Professor of Marketing at INSEAD Business School who has over 100,000 books to his name and 700,000 books listed to his company at Amazon.com, each written in about 20 minutes by a robot (a computer system which can write technical books, and whose cousins are working on doing novels). Automation is reaching the sphere of literary production! In a video post on the book, Rethinking Race against the Machine, John Hagel recognizes how automation makes many jobs vulnerable to elimination, but questions the framing of the fact as a technical challenge. The strategy of corporations has been to define work in ways which make it a perfect target for outsourcing and automation, by striving to define standardized, highly scripted work. But in the current environment of uncertainty, where black swans define our reality more than stability, such work provides little value and is in fact best done by machines. Hagel calls on managers to innovate our institutions and work practices to allow us to race with the machine, rather than compete with it. By inventing work which deals with complexity, our human capacity for pattern recognition and creativity once again comes into its own, and the machine can support us rather than replace us. The lazy dependence of companies and managers on the mechanical paradigm of work is creating a world in which work is an increasingly rare commodity–a paradoxical situation in a world crying out for innovative solutions to complex and systemic problems whose implementation will give everyone more than enough to do. It is in such an environment of human and complexity-centred innovation that talent management, in the deeper sense of profound interest in the development of human beings to deal with complex problems, comes into its own. Compliance is killing our organizations, and the function in which this is most painfully obvious is Human Resources. People are among the many living things which cannot practically be reduced to ordered systems processes–at least not without destroying the very qualities like intelligence, passion, motivation and creativity that make us what we are, and which are the prerequisites for success in the knowledge and creative economy we are fast moving into. In the quest to be seen as relevant business partners in corporate strategy, HR has attempted to take over the mantel of efficiency which is at home in the technical processes of production, and to gain a position of influence at the top mangement table by making a demonstrable financial contribution to the bottom line. By giving top management what top management thinks it wants, HR merely confirms its credibility gap. Henry Ford is said to have commented that had he asked his customers what they wanted, they would have said a faster horse-drawn carriage. HR’s dilemma is that compliance in terms of the ordered systems paradigm of production and finance does not give top management the agile, flexible and motivated workforce it needs, but quite the opposite. To make a strategic contribution to value in the knowledge and creative economy, HR will need to break with the ordered systems paradigm still governing the thinking of many Boards, to treat its subject matter on its own terms. People are living organisms, not trivial machines, and so belong to the domain of complex adaptive systems. A teaching metaphor by David Snowden at Cognitive Edge, a colleague from the field of knowledge management, helps to illustrate the difference between the three kinds of order that exist in nature (chaos, order and complexity), and their implications for managing people in this short video called How to Organise a Children’s Party. The complexity solution to people management, which Dave describes as “managing the emergence of beneficial coherence within attractors, within boundaries,” provides an alternative to current ordered systems management and HR approaches which is based on self-organisation. But it is one which also requires a shift from the attempt to manage talent by establishing bureaucratic processes, to one of engagement with talent on an operational level, where solutions can be tailored to the unique circumstances and requirements of the actual business. What Robert Bolton recommends for HR in the summary to the KPMG study is a shift in the operations of HR from cenralized planning and control (“the doom loop”) to a transitional role as a shared services organization staffed by “people agenda architects” reporting to a “Chief Change Officer:” Ultimately, “Some organisations could go even further and have leadership taking direct control of people programs…” HR responsibility would radically decentralize, and HR would morph into a change management organization driving strategic initiatives through its interaction with people. What this would likely mean is that talent recruiting and development would no longer be managed, but fall within the domain of entrepreneurial decision-making and trial-and-error experimentation. As such, the Board would take a direct interest in its high potentials, as Brin and Page have famously done at Google (and which Eric Schmidt describes in this interview at 1:50 as “smart people want to work with smart people and want to be informed…” in an empowerment model of governance), even as the organisation has grown exponentially to corporate dimensions. Like at Google, talent management would become “disintermediated,” meaning that decisions about talent would no longer be filtered through HR evaluation processes to be reported up the hierarchy in the form of metrics for final approval, but would be made directly by managers responsible for results. Unlike Google, however, whose top-down talent model of the start-up years cannot be replicated by established companies, decisions about talent would be decentralized and made at the operational level, where the practical knowledge about what is needed, combined with the social sense to know what works is located. What it would also mean is that “talent” in all its facets would stop being the focal point of an annual management ritual, but would be the primary focus of daily work. Talent development would become less an exercise in evaluation and training, and more one in experiential learning rooted in actual change management projects triggered by market challenges, where “talent” would have the opportunity to take responsibility for achieving business priorities, learn through trial-and-error, and show through performance what results it is capable of achieving. Management would need to provide their people with the priorities around which they could self-organize, with the resources they would need to power their efforts, and with the ethical, legal and risk frameworks which would define the boundaries of their self-organization. HR–to the extent that it would carry such a name or even exist in a recognizable form–would provide the tools (IT and processes) to enable transparency and communication, and do the mentoring and coaching the managers would need to keep their focus on their people and to do a good job of challenging and fostering them in their evolution and growth. Two clients of mine have posed the question to me about how HR can operate successfully in the emerging environment of complexity and Gen Y employees challenging companies today. The question is surprisingly difficult to answer, as a scan of the web turned up no approaches which I could in good conscience recommend, but much which represents the ordered systems paradigm of old style management. My first client is responsible for HR in a family company operating world-wide, with a decentralized organization coordinating performance in largely independent country organizations, which are very successful and fiercely autonomous. His first attempt to professionalize HR by implementing bureaucratic processes failed, for the simple reason that the countries scented the danger to their autonomy and performance and blocked the initiatives. When we had our first meeting, the client wanted to talk about organizing a world-wide high-potential group to bring the regions of the organization into better contact with one another, and about how to embed the meetings of the group in an HR selection, development and retention strategy which would support the company’s independent culture and avoid a second rebellion. I suggested they skip the bureaucratic middle step and go directly for a participatory approach based on the insights of complexity strategies–an approach we will be developing together over the coming months in preparation for the next global meeting. Here are the first outlines of what we are thinking about, starting with some context in the current norm, before we go to more complexity-based approaches. The modern HR model saw its most prominent initial large-scale implementation at GE under Jack Welch, who focussed talent development not only on what people in the company deliver, but on how they deliver it based in a competence model which describes behavioural success factors for leadership and performance. A good representation of this approach is given by Gary Steele, the Head of HR and Sustainability at ABB in Zurich in an interview, where he describes people and talent management as the “spine” or “thread” that determines everything ABB does. The purpose of the programme is to drive the culture of performance and delivery across the organisation. Part of the programme is top-down, through leadership assessment based on a competence model to look at how performance is delivered, and the other part is bottom-up through performance reviews that include the competence model criteria for assessment. At its heart is the attempt to develop core values, which describe the way the company as a whole does business, and to which a large part of the work of coordinating activities company-wide can be devolved. As Steele explains, the competence approach seeks to create an advantage in the “war for talents” by dealing with the problem that leaders with bad behaviour drive away valuable talent, so that even if they bring in good performance short-term, their cost in terms of people involves unacceptable risk to success. Given the good intention behind the competence model approach to widening performance management to include good behaviour in leaders, it is tragic, then, to see the results in how people experience the process, especially in large corporations that have done their homework in thoroughly implementing a talent management strategy. Through the ever tighter requirements of corporate governance, combined with a focus on short-term results, talent management largely backfires. Among the hires who come to my clients’ companies, there are a large number of corporate refugees who want out of the bureaucratic straightjacket of competence-based perfomance reviews, and into an environment in which they can work productively and focus on results–and remain the individuals that they are. As employees vote with their feet, it is apparent that talent management is making a major contribution to exactly the problem it was designed to prevent. Performance is social, in the sense that no one is successful alone. Companies create value through the work of people in groups, whether these are organized through the machine paradigm or, more modernly, in teams or networks. Although companies are social organizations, they exist not for their own sake, but for the external purpose of creating value for others in a market. There are, therefore, two coordinating principles for social organization in companies (see below). The source of the failure lies in the complete difference in nature of coordination based on judgment of results, and coordination based in social relations. The first system is transactional: we sign a contract in which we are paid for measurable performance based on explicit indicators. We fulfil a function or a role in a structure of power, and we can be replaced anytime. We follow rules, and perform functions. If we overperform relative to benchmark, we get bonuses and promotions; underperformance means stagnation or firing. Having a place in the company social group depends on what we do and how well we do it, without regard to our history, reputation, or who we are as people. Our positon is fragile, subject as it is to the vagaries of power and control and to the incalculabilities of the market and company politics. The second kind of coordination is rooted in social dynamics: in a complex reality whose vagaries cannot be known ahead of time or planned for, we look to each other as people for orientation. Through give and take, we learn to rely each other, and the history of our behaviours forms our reputation and instills trust or mistrust towards us in others. In the absence of full knowledge, we orient to values to inform our decisions, and how reliably we do so contributes to our standing in the group. Our influence is based more on our experience in dealing with uncertainty, on our tacit knowledge and who we are as people, than on our position in the organisation, and so is resilient to the changes in the power structure. Picture for a moment the dynamics of the goal-setting meeting between a manager and an employee in sales. The manager’s incentive is to set a high goal for the sales represenative, both to maximize performance and to minimize the bonus. The incentive of the sales representative is to agree to a minimal goal, both to reduce effort and increase his certainty of achieving results, and to maximize the bonus. The boss says 20%, the sales rep. 0%. Then it is 15-5, and agreement might come at 10%. There are always good arguments for both sides. However it is achieved, the result is not an objective response to market realities and a reflection of personal abilities, but a negotiated settlement which has to do much more with the illusion of planning and with tactics. In the worst case, top-down planning is simply imposed through the agreement, and the employee is told to perform accordingly. When behaviour is treated on the basis of the same logic, the result goes beyond the pseudo-objectivity of the planning process to effect cynicism and distrust in the social fabric of the organisation, as an employee report on the Stack-Rank performance review system at Microsoft under Steve Balmer devastatingly shows. In the video above, the interviewer mentions to Gary Steele that talent is an emotional issue, and asks him (without any apparent sense of irony), how to mandate the emotions aimed at by the talent management process. Steele doesn’t lose his stride. Picture the same sales representative negotiating about the evaluation of his behaviour as a communicator and team player. His manager may criticise his behaviour, and the sales rep. will explain or justify himself. The manager will find examples, the sales rep. counter-examples. In the end, the evaluation is just as arbitrary as the planning number, with the employee trying to show himself from his best side, while the manager tries to reduce him to his failures to satisfy the bell-curve of possible evaluation distributions. The best managers, who genuinely try to support their people’s development, learn how to game the system, giving their team a leg-up relative to others in the rating game, against which HR must find counter-measures, and so the irrationality potentiates itself up the system. The simple answer to the question of how you mandate emotions is, “you can’t.” Values, beliefs and emotions cannot be mandated, and attempts to do so bring with them all of the nasty consequences of social engineering. To enable people to develop their potential, what my client and I are working on is how to ensure that performance appraisal on the one hand, and potential for development and growth on the other, are treated differently, each according to its own logic and mechanisms of success, and the one is not collapsed into the other. This is simple to do, but difficult to manage within a short-term performance measurement environment. 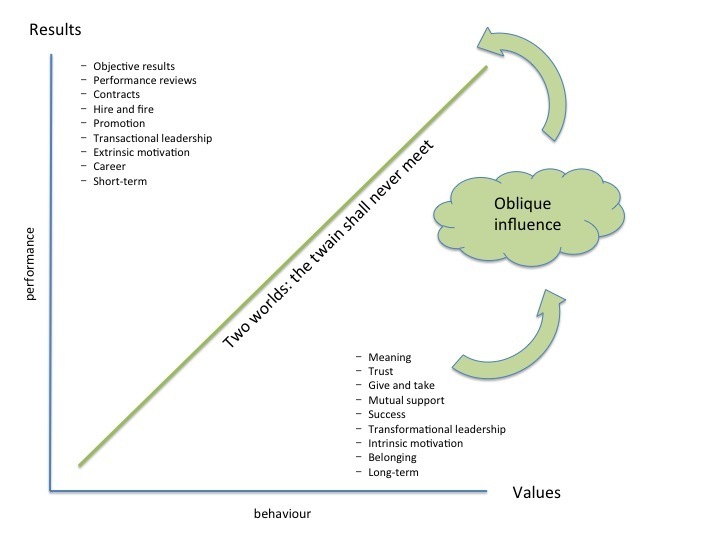 The key lies in the concept of “obliquity,” and in the ability of the company culture to tolerate the disconnect between supporting the development of employees on the one hand, and planning for and getting results on the other. Very much according to the maxim of giving unto Caeser what is Caeser’s, key performance indicators need to be aimed at, and results measured. But since only a tiny part of what takes place in companies operates on the transactional level of planable ordered systems, the rest is beyond direct control. For system two, managers need only to foster human potential and… to trust! And that is what makes system two management so intolerably uncertain for classical management. 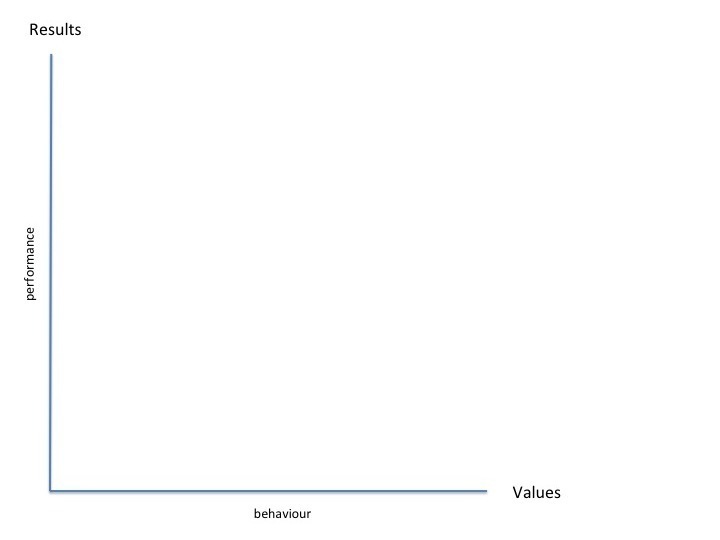 The highest performing groups are the ones whose skills we support, but whose behaviour we do not measure. The whole point of transactional goal-setting is that it does not matter how we get there–only the results count. 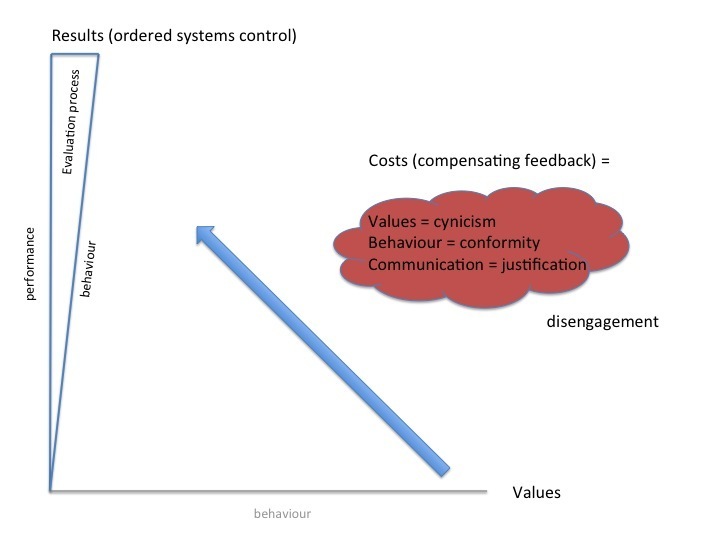 What organisations can do to support the process of social self-regulation is to provide their people with the resources and opportunities to do so, not to sabotage their efforts through bureaucratic, pseudo-objective planning and control systems, to listen, and to take the opinions of their people seriously when it comes time to make decisions about talent. For the rest, “talent manages itself,” as Kevin Wheeler and Murry Christensen of Jet Blue say in an interview snippet from the Future of Talent Retreat 2009. That is of course a simplification, as talent flourishes best in a rich environment full of experienced people, interesting challenges, trustworthy leaders, and immediate reality-based feedback– things which do not happen by accident. That will also be the point of the Talent Management strategy, to focus on creating the environment and resources talent needs to succeed. My second client is at a different point in his trajectory, having come to the insight that the traditional and informally highly networked family corporation lacked even the most rudimentary global processes in many areas, including HR, and the new General Managers have embarked upon a thorough and consequent strategy of making the organisation compliant through stricter process-orientation. While getting their ordered systems processes created and under control will be a boost to solving many of their challenges, it will be interesting to see where the system type boundary is seen and what influence it will have on Talent Management. Post Scriptum: By the way, the talent development challenge in business is logically identical to the problem of learning and performance measurement in the education of our children, as the more we measure learning performance in schools, the less education our children receive, leading to poorer–not better–performance in the jobs market, as a lucid RSAnimate video of a talk by Sir Ken Robinson explains for the curious, and from which I am tempted to see an analogy between the “epidemic” of ADHD in children and the alarming rates of burnout among managers who are caught between competing imperatives of the two systems they work in, and which companies do not help them to resolve. It is one of the signs of our political times that many–if today not most–arguments about policy e.g. economics, history, social policy and women (especially about the role of women in society!) are based not in rational analysis but in competing beliefs about what is good and right for the world. As a moral psychologist, Jonathan Haidt researches the question in his book The Righteous Mind of “why good people are divided by politics and religion” through his model of “moral foundations,” which describes how we make decisions in terms of biologically evolved moral “modules” which determine our allegiances, associations and rational justifications of our moral proclivities prior to any act of reasoning we might use to justify our leanings after the fact. The book first establishes the current neurobiological understanding of the role of thinking in the debates with the insight that for all thinking, “intuitions come first, reasons second.” He uses the metaphor of the elephant and the rider to describe how the rider of our thinking may believe it steers the elephant of our moral intuitions, but when we look at the results of research into decision making we see that it is invariably the elephant which moves first, with the rider leaning in the elephant’s direction after the fact and using reason to justify its leaning post hoc. Around the world, liberals, he has found, base their morality and their political orientation on the first three foundations. Conservatives are based roughly equally in all six foundations, while liberterians constellate almost entirely around the Liberty/Oppression module with a smattering of a conservative version of Fairness/Cheating thrown in to round things off. Even more intriguing is Haidt’s understanding of the origins of our moral leanings which, he finds, e.g. through the studies of twins, are less learned than they are biological predispositions. What we believe, how we see the world, what we feel strongly about, and how we vote is largely due to our biological predispositon to some or all of the modules which universally make up the foundations of our moral intuition. What moral foundations theory helps me, for example, to do is to experiment in my own self-reflective processes more consciously with the orientation to those moral foundations which I have less of a natural affinity to. For example, as a modern, European, self-employed networker, the moral foundation of Authority/Subversion plays no role at all in my moral leanings. Yet I recognize the importance of healthy authority in child rearing, community organization, company leadership, and in many decision making processes. And my experience of the 60’s has helped me to understand how anti-authoritarian rebellion can cause Harm, the downside of a moral foundation of Care which is very important to me indeed. In my business dealings with Arab and Asian cultures, understanding and respecting the Loyalty/Betrayal module or the Sanctity/Degredation module can be critical to the success of both business and social relations. Haidt provides a good map to go exploring with, and adventure is guaranteed, especially for people like myself operating with only a part of the total foundation we share as human beings. The final conclusion which Haidt arrives at for himself, however, and the recommendation he gives to resolve the impasse in current debates, falls entirely too short of where I thought he might be going. In an impulse to quantitative completion, Haidt argues that liberals and libertarians might have something to learn from the conservative orientation simply because the conservative moral landscape involves all six moral foundations, whereas the liberal involves only three and the libertarian only two. More, Haidt seems to argue, must be better. But the fact that our brains have evolved these six modules cannot, in my evolutionarily inspired view, automatically mean that having any version of one of these modules active is better than not having it operating at all. For example, in liberals, the Sanctity/Degredation module plays almost no role in responses of moral intuition. For the conservatives it does. But the current conservative version of Sanctity/Degredation issues is rooted in religion at the developmental level of a mythical consciousness. Liberals, in their more secular/scientific approach to life, have little patience for mytholgocially-based imperatives. Does that mean that liberals lack the Sanctity/Degredation module? That would seem to be unlikely, since even if through evolution certain brains focus less on the second triad of foundations than others, too little evolutionary time has passed for the second triad to have atrophied completely in the liberal brain. Liberals, I would think, respond just as intensely to the issues of life from the Sanctity/Degredation module as conservatives–but differently. As Haidt also notes, the counterculture interest in spirituality, meditation, alternative medicine and natural foods had a “purity” aspect which would seem to fit well to the Sanctity/Degredation need (ridiculed, interestingly, by conservatives–perhaps because it reminds them of the irrationality of their own versions of the Sanctity need). To take another example, the liberal rejection of patriarchal authority as arbitrary and discriminatory would seem to express in mature liberals a need for authority more suited to a complex, networked world, not the rejection of the Authority/Subversion impulse as such. At yourmorals.org, a website run by Haidt and a number of academic colleagues, one can participate in a plethora of surveys to get a profile of one’s own moral orientation among a host of other topics loosely related to politics and morality. The few I have filled out so far put me pretty much where I expected, in the liberal/libertarian moral range. However, many questions left me feeling caught in both/and or neither/nor dilemmas, so that I answered them without feeling my orientation had been grasped. For example, I am both socially liberal and fiscally conservative, a values-orientation closer to what the Economist uses as its moral foundation than any of the parties in the US. Then I am complexity and network-oriented and not socially communitarian, which the questionnaires seem unable to distinguish from a socially liberal perspective. And while I am strongly fairness-oriented in the conservative sense of personal responsibility and reward for performance, I can’t imagine a context in which performance could operate effectively which was not created through the regulatory policies of an intelligent social community and efficient government bureacracy, again a moral orientation which the questionnaires did not seem to be able to grasp (though as I learn more, I may discover how they do include such perspectives). In sum, Moral Foundations Theory could enable us to explore the world’s moral landscape more fully, providing an objective framework for issues which most of us argue over intuitively, passionately, unconsciously and increasingly irrationally. I find it already helping me to develop a more objective perspective on these conflicted issues. What I miss is a developmental model of the moral modules. As Haidt himself seems to argue, a module represents a biological predisposition, not an orientation to a particular content. How the needs of the module are fulfilled is a question of personal and cultural development. I suspect, for example, that liberals have as much spiritual potential as conservatives in their biological substrates. But dogmatic religious beliefs and behaviors are not suited to activating the Sanctity/Degredation module of a scientific or pluralistic consciousness. I would love to experience what would happen if the religions were to update their versions of Sanctity so that a scientific consciousness could relate to them, or political leaders were to emerge who understood how to exude authority which enables networked communities and so potentially activate the Authority/Subversion module in liberals.